This weekend was one of those wonderful, very hot Melbourne weekends. Forecast 36 on Saturday actually tipped out at 41. Sunday was forecast for 41, which they revised for 43 and it almost made it there. Consequently, a lot of the weekend's activities revolved around keeping Nai in a cool environment. We had a few things to do, so we were out early on Saturday. We bought a new mattress for the cot, as well as smaller one for the basinette (SIDS-people recommend you only re-use a child mattress if it is a sibling - they don't understand why, but there is a greater incidence of SIDS with used bedware). We also picked up a few things from Bunnings for the house. By the time we got home (before noon) it was pretty hot and Nai had had enough. On Sunday, I was off killing myself in the heat (read : MountainBiking on the Commonwealth Games track at Lysterfield) while Nai went for brunch and a movie with her friend Kellie. The first thing on the agenda was to ensure of air conditioning - so after a nice iced chocolate and a vegetable panini from Brunetti's (in Faraday, off Lygon St), it was off to the Nova to see Good Night, and Good Luck which spoke about how CBS tried to counter the scaremongering tactics of Senator McCarthy. She said it was very good - and I reckon quite enlightening in current times. Anyway - nothing like the air-conditioned cinemas on a hot day, with a nice choc-top. Once Nai got home, it was back into the air-conditioned comfort for the rest of the day. Thankfully, the change arrived early in the evening, although they are prediciting another bout of very high temperatures later this week. We read that the BB has pretty much stopped growing in length (average is around 45cm from head to toe), but will spend the remaining time in-utero putting on around 250g per week until it's time to pop out and see the world. 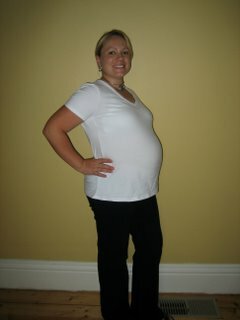 Nai is still keeping up with the Pilates, and we have our next HypnoBirthing session on Wednesday. She's starting to scale back at work a little and may, if possible start late or leave early if she needs to. Maybe even snooze in the car after lunch and/or listen to a hypnobirthing CD in the car when possible.